buy bodies for the sake of advancing medical knowledge. a price must be paid, even by the anatomist supreme. "A thought-provoking performance at The Theatre Royal, Dumfries by the Isosceles Theatre Company and two outstanding Irish actors, Pat Abernethy and Dave Marsden. 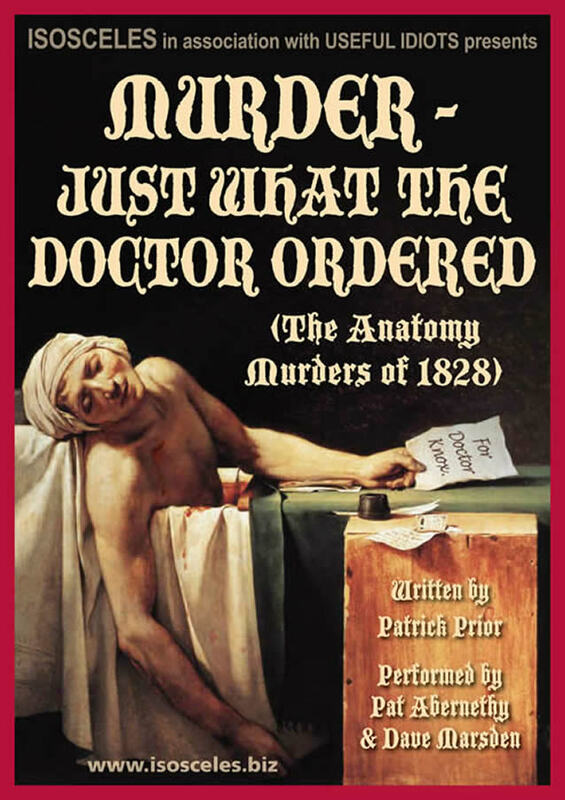 The audience encounters an egotistical anatomist, two money-driven murderers and a host of characters who fall into their dark clutches....The play was brilliantly acted, Pat and Dave are true professionals. They engaged their audience from start to finish, revealing a period in history where you were literally worth more dead than alive. Bravo Isosceles! A superb performance, highly recommended"
"I go to a lot of theatre and you are as good as anything I have seen at the RSC (Royal Shakespeare Company)"
"You performed the piece beautifully - my own friends spoke about it with such enthusiasm afterwards"
"We enjoyed your play so much. A fascinating story, brilliantly delivered. Bravo"
"Always a joy and always informative and thought provoking." "The dry wit and joyful energy which you exude on stage communicates superbly and your audience wants to be nowhere else but directly involved - you are ace story-tellers." "Wonderful performance... Can't think of a better way of spending an evening." "Brilliant play, we really enjoyed it." "A terrific evening, I was gripped from beginning to end." "Many congratulations on a brilliant performance this evening - I really enjoyed the show." "Excellent show. Beautifully paced - my friends were very impressed and talked about the quality of the acting and music." World Premier 24, 25, 28 September 2015 at the Royal College of Surgeons, Edinburgh.